The new stompboxes boast expanded capabilities and updated analog design. 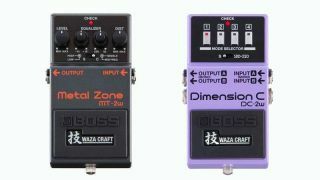 Boss has unveiled updated Waza Craft versions of their MT-2 Metal Zone and DC-2 Dimension C pedals. The special-edition Waza Craft pedals are made in Japan and feature expanded capabilities and updated analog design. The MT-2W Metal Zone features two modes: Standard, which delivers the original Metal Zone’s mid-range-focused tone, only with more response and definition; and Custom, which offers increased dynamics and rounder lower mids for a sound that is more suited to today’s more high-gain styles. Additionally, a three-band EQ provides intense sound customization with High, Low, and sweepable Midrange and up to 15 dB boost/cut on each band. The DC-2W Dimension C offers a pristine sonic recreation of the original DC-2, as well as the SDD-320 Dimension D studio rack effect the pedal was based on. Standard mode provides the sound of the DC-2, while SDD-320 mode authentically reproduces the vintage Roland SDD-320 Dimension D.
The DC-2W boasts four main sounds in each mode plus six variations by pressing two switches together, for 20 total sounds in all. Additionally, the original four-button preset interface has been updated with electronic switches and LED status indicators. The DC-2W is available for $339, and the MT-2W for $189. For more information, visit Boss.